You can find short YouTube video (3mins) at the bottom of this page which tells the story behind our site. In the video we tell the story about a guide-book, The Famous & Historical Pubs of the South-East, which we produced in 1991. It sent us down memory lane … for a while; all those pubs that were featured in the book, way back then, how are they faring now? When we decided to google a couple of the pubs we were surprised and astonished at the fate of some of them. A mere 21 years has passed since the book was published, but there have been huge changes to the Irish pub and in Irish drinking habits during that period. One pub that I had a particular fondness for was The Oak Tavern, a small roadside pub on the N11 in Ferrycarrig, just outside Wexford Town. This pub had everything; authentic interiors, beautiful historical location on the river estuary looking out at the old Norman Ferrycarrig Castle and a jetty outside for mooring pleasure boats etc. 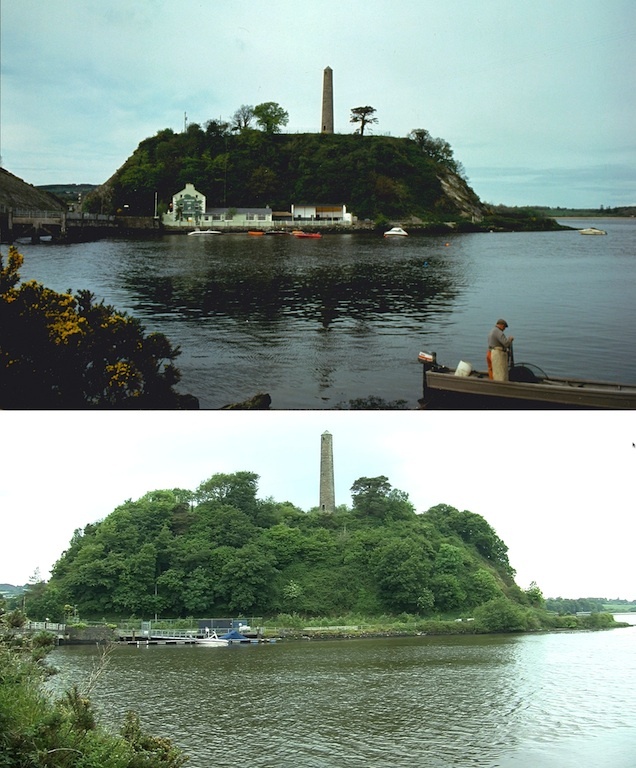 It was located right beside the National Heritage Park and as you can clearly see in the photographs, the park’s round tower even added to the attraction of the location by looming over the pub in the background like a sentinel. Google sent us to tripadvisor.ie as one of our first ports of call in our ‘research’. The ‘trip advisor ‘search was not very reassuring however, as it produced only 2 results for The Oak Tavern, and the news wasn’t good. ‘Gone, Gone, Gone!,’ shouted the first headline, the entry written by somebody who obviously cared for their readers feelings. ‘For anyone looking for the Oak Tavern I am afraid to say you will have a hard time trying to find it as it was demolished in a fire a couple of years ago!,’ they wrote in 2007. He probably didn’t get a Christmas drink that year either. Poor sod. 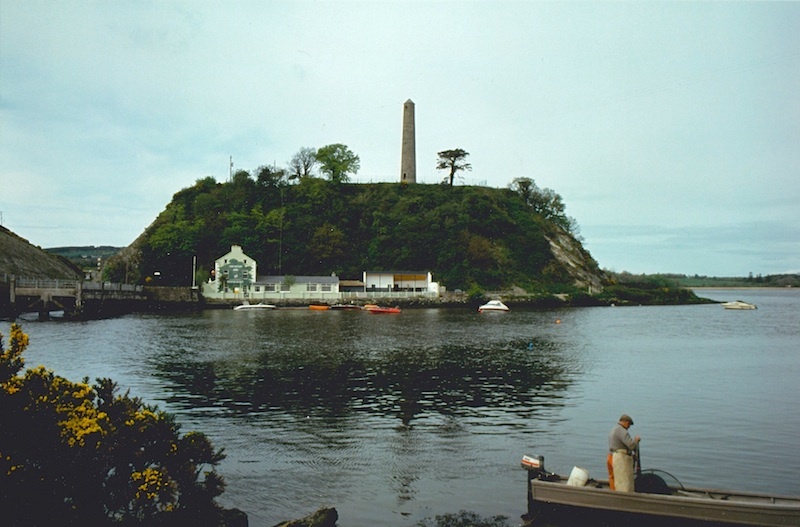 Wexford town’ said Mr. McGuinness, adding that he and his brother had plans to run water bus tours from the premises. This truly is the end of an era, and it happened on our watch. But this is just one pub. Because of a perfect storm of conditions, from economic recession, stricter drink driving laws and new smoking legislation, the Irish Pub has had a couple of seriously damaging years. That coupled with changing drinking habits, where many people are now preferring to drink at home, a once very profitable and buoyant industry has been dragged to its feet. Last year 270 pubs didn’t renew their licenses. Over the past couple of years, more than 1,000 pubs have ceased trading. There are now 7,500 pubs trading in Ireland, that’s nearly half the number trading in 1991, the year we published our book. Obviously there are a lot of issues here. Not least is the fact that all these pubs are licensed dealers of a controlled drug. Some will argue that controls are not tight enough, while others will say that they should be loosened up. What ever your opinion, you can have your say, join the conversation here on the site or on our Facebook page. We would like to hear from all parts of the country. Send in whatever material you have or take a pic or short video of another pub that has ceased to be. We also want to hear of the success stories, the ones that are surviving and thriving against the odds. SHARE - if you like! ..... SHARE - if you don't like! A new kind of ‘Road-House’ – Irish style. Popular old pub now a dump. Rural pub owner speaks about the demise of the rural pub. Beeronomics – You’re Joking me! The Famous & Historical Pubs of the South East. Copyright © 2018 ~ The Disappearing Irish Pub ~ All Rights Reserved. Magazine Premium created by c.bavota.